View More In Solid State Relays. 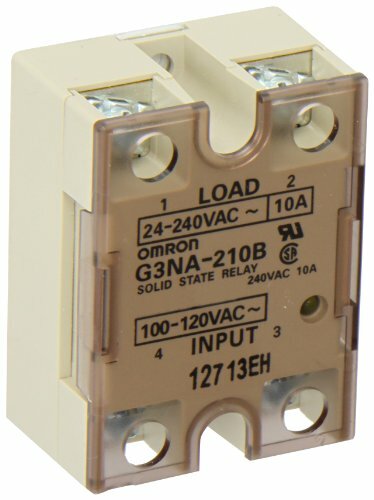 This Omron G3NA-210B-AC100-120 solid state relay has a zero cross function, a built-in operation indicator, photocoupler isolation, and is suitable for high-speed switching in low current applications. It has a load voltage rating of 24 to 240 VAC, a load current rating of 10 amp, and an input of 100 to 120 VAC. This relay has screw terminals for connecting to contacts and zero cross functionality to reduce noise generated when the load current rises suddenly. The photocoupler component isolates the input and output signals by transferring the input signal using light, preventing high voltages from affecting the signal. It has a built-in operation indicator to alert users to the operation status of the relay. This solid state relay is suitable for use with industrial controls and commercial cooking applications.